The Fairtree Protea Equity Long Short SNN Retail Hedge Fund won the prestigious Fund of the Year award at the HedgeNews Africa Awards 2018, celebrated at a gala dinner at the Vineyard Hotel in Cape Town on February 21. The fund, managed by Jean-Pierre Verster, also took the honours in the long/short equity category, with a net return of 24.35% and a Sharpe ratio of 1.66 for calendar-year 2018, during which the JSE All Share Index declined by more than 8%. In the fixed income category, the award went to the Southchester Smart Escalator Prescient QI Hedge Fund, with a net return of 14.88% and a 4.91 Sharpe ratio, in a year in which South Africa’s All Bond Index gained 7.6%. There were dual winners in the market-neutral and quantitative category, where funds put up a strong showing in negative markets. The AIP NCIS Active Alpha Retail Hedge Fund (net return 10.85%, Sharpe 2.35) and the Nautilus MAPIII Retail Hedge Fund (net return 18.41%, Sharpe 1.24), managed by Dr Nafees Hossain at Prescient, each took home a trophy. Amongst South African multi-strategy funds, the Coronation Multi-Strategy Arbitrage Hedge Fund emerged victorious (14.86% net return, Sharpe of 1.16). In the specialist strategies category, the Polar Star SNN QI Hedge Fund earned the trophy, with a 12-month net return of 12.18% and Sharpe ratio of 0.71. Many Africa (ex-SA) portfolios had a tough time in what was a negative year for most listed African markets, with the Challenger Trade Finance Fund winning the Pan Africa award with a net gain of 8.76% (in USD terms) and Sharpe ratio of 26.92. In the fund of hedge funds categories, the TriAlpha SNN Enhanced Fixed Income QI Fund of Hedge Funds was the winner amongst fixed income portfolios (7.89% net return, Sharpe of 0.75) while the Novare Mayibentsha Market Neutral Qualified Fund of Hedge Funds took the honours in the multi-strategy category (8.34% net return, Sharpe of 0.93). In the longer-term categories, Terebinth Capital’s Nautilus MAP130 Retail Hedge Fund triumphed over three years (net annualised 15.47% return, Sharpe of 1.6), while the Fairtree Assegai Equity Long Short SNN QI Hedge Fund excelled over five years (net annualised 16.96% return, Sharpe of 0.68). Amongst fund of hedge funds, TriAlpha SNN Enhanced Fixed Income QI Fund of Hedge Funds garnered two more awards on the night, winning the five-year performance category (net annualised 8.07% return, Sharpe of 1.42) and also the three-year performance title (net annualised 8.49% return, Sharpe of 1.37). The New Fund of the Year award, which covers funds launched within the past 12-23 months, went to the Prime Multi-Strategy QI Hedge Fund, with an impressive net gain of 33.68% and a Sharpe of 1.21. To mark their 10th anniversary, the HedgeNews Africa Awards also recognised the best funds over 10 years. The Polar Star SNN QI Hedge Fund took the kudos for best single-manager fund over 10 years, with a net annualised return of 20.26% and a Sharpe of 1.06, whilst Old Mutual Multi-Managers Long Short Equity Fund of Hedge Funds took the title amongst fund of funds (net annualised return of 11.11%, Sharpe 0.91). “The markets were tough and volatile in 2018 and we are pleased to note how many funds in the HedgeNews Africa database delivered strong returns to investors while protecting against downside risks. It again demonstrates that alternative strategies have an important role to play in investor portfolios,” said Gwyneth Roberts, editor of HedgeNews Africa. The awards recognise the best risk-adjusted returns of alternative strategies and hedge funds in South Africa and the broader Africa region each calendar year, based on an established methodology and independently verified data submitted to HedgeNews Africa, the region’s leading independent publisher focused on the hedge fund and alternative asset management industries. In total, 68 nominations were given across 16 categories, with the one-year awards ultimately going to those funds with the top return provided their Sharpe ratio was within 25% of the top Sharpe in the category – a method to appraise consistency of returns. 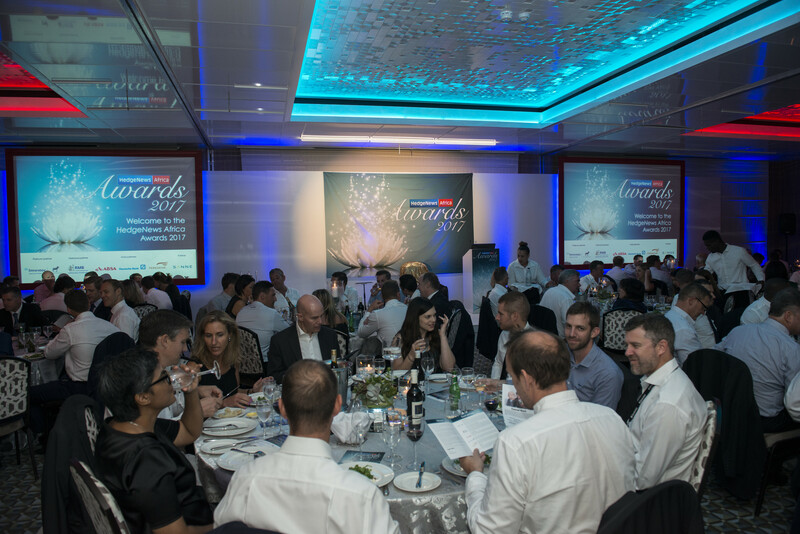 Attended by the industry’s leading fund managers and investors, the annual awards were hosted in partnership with top industry service providers, namely Investec, RMB, Absa Capital, Legae Peresec, Realfin and SANNE. January 2019: South African hedge funds turned in a positive median in 2018, with the HedgeNews Africa South African Single-Manager Composite adding 5.18%, while the JSE All Share Index declined by more than 8% and the All Bond Index added 7.6%. By category, fixed income hedge funds were the strongest, adding more than a median 10% for the second consecutive year, followed by market-neutral and quantitative funds, which gained a median 6.18%. Multi-strategy funds ended the year 4.14% higher while equity long/short protected against the downside with a median decline of 1.79%. The markets were complicated, however, with an emerging-market exodus causing volatility, while a string of corporate landmines posed challenges for many managers. Against this backdrop, many funds delivered strong risk-adjusted returns over the 12-month period, as our final contender list for the upcoming 2018 Awards shows. Now in their 10th year, the awards are based on risk-adjusted returns for calendar-year 2018, using an established methodology that comprises net returns as well as Sharpe ratio as a measure of volatility. The award in each category will ultimately go to the fund with the highest return over 12 months, provided its Sharpe ratio is within 25% of the top Sharpe amongst the nominees. To qualify for a nomination, funds must average a minimum of $10 million, or R80 million, in assets under management in that strategy throughout the calendar year (in fund structures plus associated segregated mandates). Exceptions are made in the New Fund category, which allows for lower AUMs, and considers funds with a track record of 12-23 months (with the award based on calendar-year returns) and the longer-term awards, for which higher minimums apply. Data used in deciding the awards will be independently examined by eComply Consultants to ensure consistency and accuracy. Funds submitting their monthly returns to our database are automatically considered for the Awards. New funds can submit data to data@hedgenewsafrica.com before the end of November. To book your table at the 2018 Awards please email events@hedgenewsafrica.com. Alternatively, download the Awards table booking form here. • Table of ten: R36,000 ex vat / US$3,000. Tables are limited so book early to avoid disappointment. HedgeNews Africa is pleased to be working with eComply, the independent examiner of HedgeNews Africa 2018 Awards.